Photo-sharing phenomenon, Instagram, is not just proving popular with snap-happy consumers but is also gaining favour among marketers, with almost half of the world’s biggest brands now posting photos of their own. Analysis from research firm Simply Measured shows that 40% of Interbrand’s top 100 global brands were using the platform to build their presence among its 80 million registered users. While uptake of the tool among big brands is behind Facebook’s 98% adoption rate, Twitter’s 94%, Google+’s 64% and Pinterest’s 51%, the adoption rate is impressive considering Instagram’s relative youth, its strictly photo-posting focus and the fact that it’s a mobile-only network, the report argues. The 40 Interbrand top 100 brands utilising the platform control a combined audience of 3 million users, with the earliest adopters naturally having more followers. The top 10 brands dominate, commanding 96% of followers, with MTV and Starbucks standing out, each boasting 750,000-plus followers. At number four, Nike has fewer but more passionate followers than the rest of the pack, receiving the highest number of likes and comments per picture. The most active category on the list is luxury brands, with strong showings from top-performers such as Burberry, Tiffany & Co, Audi, Hermes, Gucci, Mercedes-Benz, BMW and Armani, all of which are in the top 15 for engagement levels. The study also found that the majority of brands that have Instagram accounts are actively using them: more than 25% post at least one photo per week and 17 of the brands on the list have 10,000+ followers. 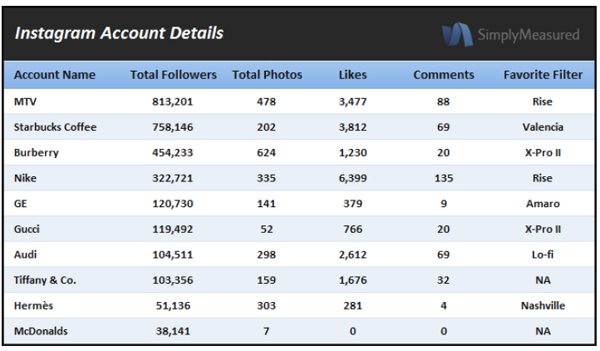 There is a strong correlation between the number of followers and engagement per photo. In an insight for lovers of the photo sharing trend, the ‘Valencia’ filter emerged as the most popular, generating the highest engagement levels despite being used in only 7% of the photos posted by the brands analysed. ‘Lo-Fi’ has the highest usage across the board, but slightly lower engagement. As Instagram approaches its two-year anniversary, Simply Measured predicts it will hit 100 million users and become an increasingly important social network for brands. “While building a strategy around a mobile-only, exclusively image-based platform can seem daunting, the growing audience is engaged, and top brands are taking advantage of this,” the report concludes.